An Arizona entrepreneur who owns a large limousine concern has painted the newest vehicle in his fleet in a Thin Blue line Flag theme. The bus—the newest in the JET Limousine fleet—bears the well-known Bible verse, "Blessed are the peacemakers, for they will be called children of God." It also displays the names of 14 Arizona officers to have been killed in the line of duty in the past decade. Image courtesy of JET Limousine / Facebook. An Arizona entrepreneur who owns a large limousine concern has painted the newest vehicle in his fleet in a Thin Blue line Flag theme. 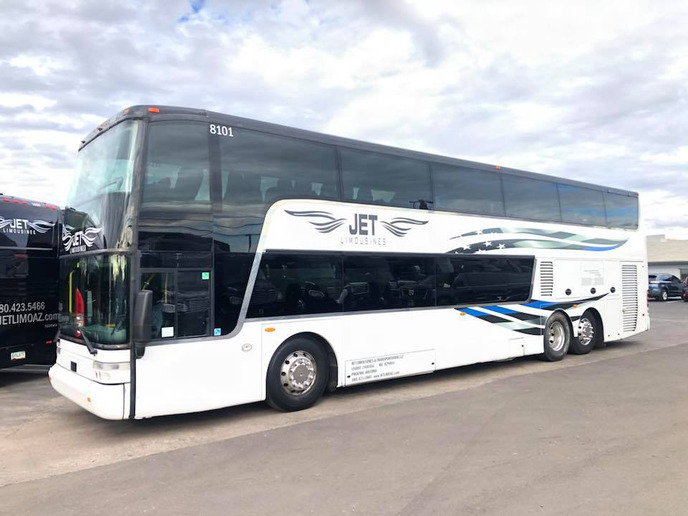 The bus—the newest in the JET Limousine fleet—bears the well-known Bible verse, "Blessed are the peacemakers, for they will be called children of God." It also displays the names of 14 Arizona officers to have been killed in the line of duty in the past decade. Billy Jinks said in a Facebook post, "It took me a long time to figure out what I wanted this bus to look like....and I'm so excited to have it apart of our fleet. Although we’ve lost many heroes in this state and around the world, this is a tribute to each one JET has been a part of. Each one of these names I've either known, met, worked with, or they are close to those that I consider my friends and family. Its maiden voyage will be tomorrow at Officer Townsend's services." Sal River Police Officer Clayton Townsend was struck and killed by a vehicle while conducting a traffic stop on January 8, 2019. The driver admitted to texting and driving at the time of the incident. He was charged with manslaughter, aggravated assault with a deadly weapon, and endangerment.